A more hard-core IS-F could be ready to take on the Mercedes-Benz C63 AMG Black Series. At the Toyko Auto Salon last year, Lexus unveiled a concept version of the IS-F performance sedan called the Circuit Club Sport Racer, or CCS-R for short. While its 5.0-liter V8 engine remained unchanged, a number of upgrades were included. The mods added up to Lexus transforming the IS into a DTM-grade touring car, but the Tokyo Auto Salon being closer to a Japanese version of the SEMA show than a more mainstream auto expo, we knew it wasn&apos;t about to put it into production. Or will it? The CCS-R featured a full race-spec aero package that would make the LFA Nurburgring edition look like childsplay, along with a track-tuned suspension, stripped-out interior and competition-spec rolling stock. 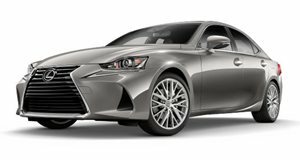 A good year since its unveiling, reports indicate that Lexus is willing to consider offering the IS-F CCS-R if enough customers line up to lay their cash on the carbon-fiber hood. Whether the CCS-R makes it to production, however, Lexus is reportedly looking at the concept as a benchmark for the next-generation IS-F, which could follow its German competitors&apos; lead and drop the V8 for a twin-turbo six.